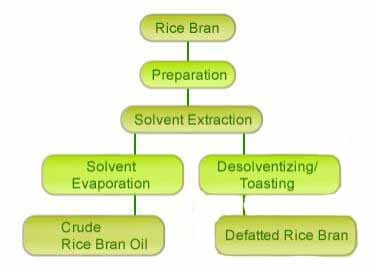 Rice bran oil solvent and refinery is needed when the crude oil extracted from rice brans needs further treatment to convert it to a bland, stable, nutritious product that is used in the manufacture of margarine, shortening, salad and cooking oil, mayonnaise, and other food products. Several processes may be used to produce an edible oil. We mainly use the caustic refining process of rice bran oil solvent and refinery which is the most widely used and probably the most eliable to produce good quality oil. Crude rice bran oil is normally defined in terms of moisture and dirt, phosphatide content normally expressed as ppm phosphorus, free fatty acids (FFA) or acid value and also in terms of color, oxidation characteristics, and trace components such as iron and copper. 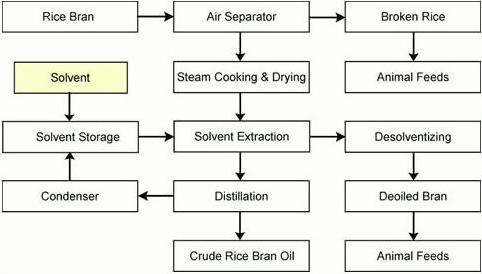 Edible rice bran oil refining process always including the following sections: degumming, neutralizing, bleaching, deodorizing and dewaxing. In order to meet different clients' requirements, we have a wide range of equipment with capacities from 300 kg to 100 metric tons. When refined, oil grades may qualify as Grade 1, Grade 2, Grade 3 or Grade 4. There are two technologies: one is batch, the other is continuous. Normally we adopt batch-type processing for capacities less than 20 t/d. Otherwise the process adopted is semi-continuous or continuous. If you are interest in our oil equipment or you want to set up an oil milling plant , please don't hesitate to write to us from the following form, we are always at your service!